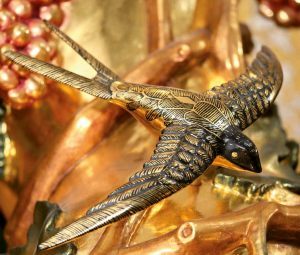 For more than a century, the artisans of Talleres de Arte Granda have produced fine original sculpture for the adornment of churches and chapels. The sculpture workshop maintains a collection of more than three thousand models for statues, from past projects and from historical precedents. Any one can be used as the model for a new statue; the models shown in the catalogue represent only a small portion of those available. Statues are available in any size more than three feet tall, and smaller home items are also available. Completely new designs are also available. Customers may request statues of saints for whom models do not yet exist, including those recently raised to the altars. 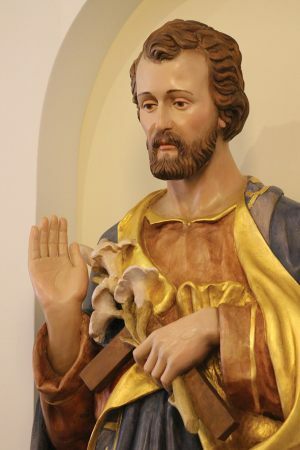 Parishes and religious communities have commissioned statues of saints with attributes particularly significant to their devotion, or in a specific historical style. 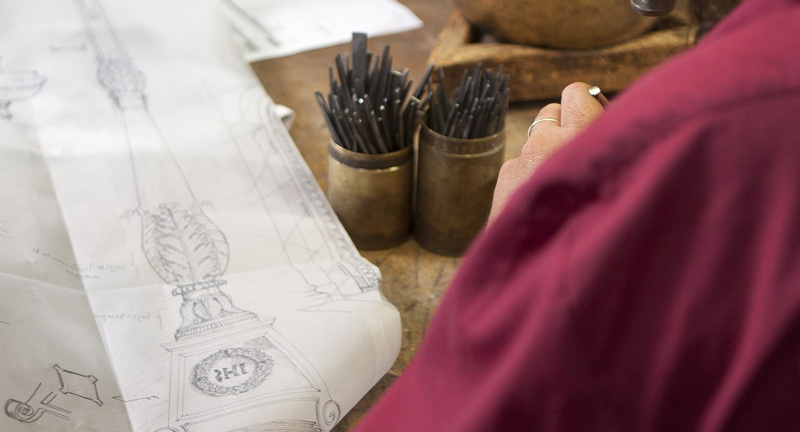 As custom statues are designed anew and crafted by hand, a great variety in design and composition is possible. For new models, the designers can prepare drawings or three-dimensional renderings for the customers so modifications and changes to details can be made before the sculpture is begun. For more prestigious projects, the faces of the figures are first modeled in clay, so the customers may approve their expressions and request alterations. Notable custom statues for American churches and chapels include those of St. Norbert and Our Lady of Guadalupe in the adoration chapel of St. John the Baptist Church in Costa Mesa, CA; Our Lady of the Presentation, St. Joseph, St. Dominic, St. Catherine of Siena and adoring angels in the chapel at the motherhouse of the Nashville Dominican Sisters; Our Lady of the Holy Trinity, St. Maximilian Kolbe and Mother Cabrini in the chapel at Our Lady of Corpus Christi College; the Crucifixion scene at St. Catherine of Siena Church in Laguna Beach, CA; St. Robert Bellarmine at the church of the same name in Arabi, LA; the Marian statue and monstrance at Calvert House at the University of Chicago; St. Francis, Bd. Junipero Serra, Bd. Kateri Tekawitha and St. Peregrine at Mission Basilica San Juan Capistrano; and all the original statues at the Shrine of the Most Blessed Sacrament in Hanceville, AL. Polychrome: The wood is covered with primer and painted in color. Gold leaf details are added. Estofado: The entire statue is primed and then covered in gold leaf. The artist paints over the gold leaf with polychrome and then etches intricate patterns in the colorful painted surface, revealing the gold underneath. This is a traditional Spanish technique; the results are extraordinarily beautiful. 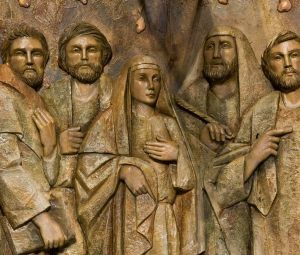 The artistic tradition of painted wood sculpture is one that properly belongs to the Church, as it is under her auspices that it reached the fullest expression of its genius. The sculptors of Talleres de Arte Granda continue this noble tradition of the identifying art of Roman Catholicism. In addition to wood sculpture, the artisans of Talleres de Arte Granda sculpt reliefs in clay, to be cast in resin or copper. 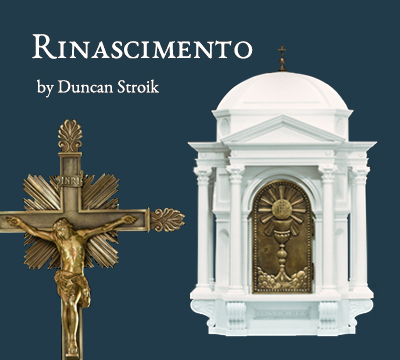 These add beauty to the walls of churches, and narrate scenes from the life of Our Lord and the saints. 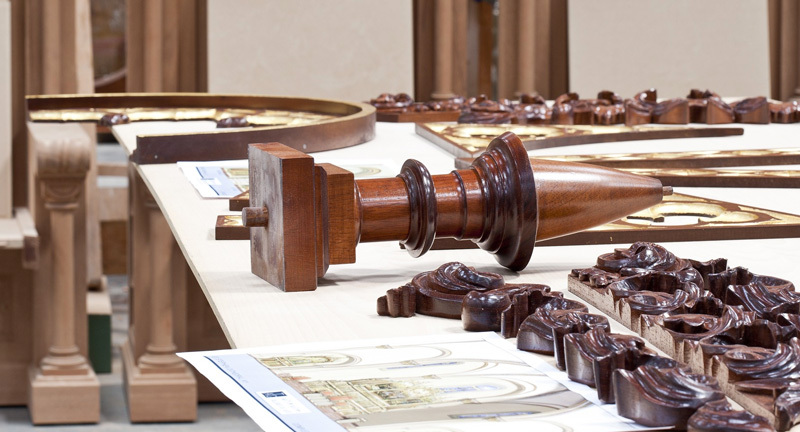 If cast in resin, they can be finished in monochrome, polychrome or estofado. 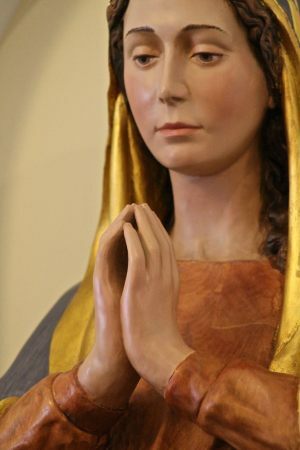 Like the statues, these can be made based on an existing model form an extensive collection or custom designed according to the specific needs of the church or chapel. Notable custom reliefs have been made illustrating the Baptism of Our Lord at St. John the Baptist Church in Costa Mesa, CA; and the life of St. Peter in St. Peter Church in Beaufort, SC. Both the statues and the reliefs can be incorporated into larger architectural elements, including shrines, altars and reredoses. Please see our page on custom furnishings for more details.